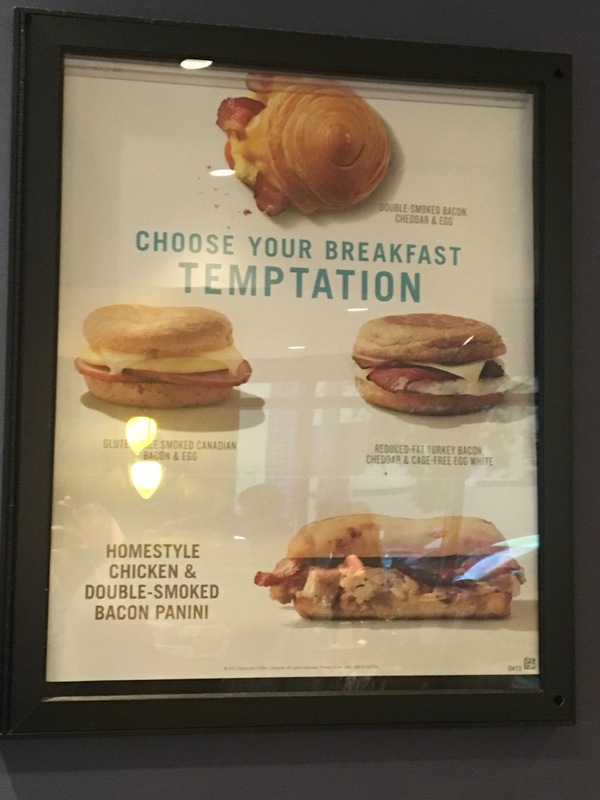 “Choose your temptation.” At first glance, I missed the “breakfast” in the sign’s headline. I’m in queue at the Starbucks at the hotel where I’m staying this week. I think, “Interesting. Choose your temptation. I bet Jesus would have fun with that play on words. I suppose we can choose that which will tempt us. The real question is how do we recognize and respond to temptation. I recognized that advertisement as a temptation to overeat. Now that I recognize the emotion as a temptation, I can make another choice. Maybe for health and keeping my waistline down. (I ate a nutrition bar in my room along with my Americano). Some temptations are more difficult to recognize. It may take a while. Wisdom is letting experience teach us to recognize temptation sooner. This entry was posted on May 24, 2017 at 7:14 am and is filed under Disciplines, Wisdom. You can follow any responses to this entry through the RSS 2.0 feed. You can leave a response, or trackback from your own site. Or wisdom AND prayer. Which you know. But in this area (and others), I think there is shared responsibility. Thank you.